Sign Pole Design, Fabrication, & Installation | Outdoor Specialist, Inc. Outdoor Specialist, Inc. always focuses on quality materials, high standards in workmanship, and timely updates on project status. We are committed to outstanding customer service from the on-site consultation to the final inspection. OSI works with you from the beginning to the final inspection of your sign pole. Our Engineering department will design a sign pole to fit your needs that will meet or exceed the standards of the local coding jurisdiction. OSI’s commitment to superior quality is matched by our commitment to keeping clients informed of project status and maximizing use of your shipping resources by completing fabrication on schedule. With our professional in-house fabrication shop, we can design and then build a sign pole to meet your exact needs. 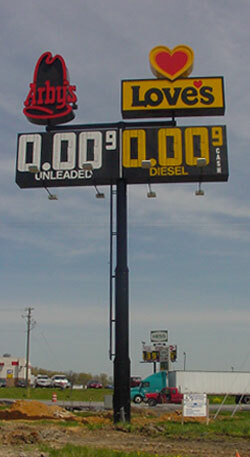 Outdoor Specialist, Inc. can design a sign pole to carry any sign, message board, or back lit display. We have a nationwide database of qualified, professional installers available. Whether you need just the sign pole or a turnkey installation, get it done right the first time with Outdoor Specialist, Inc.